Goonhilly Earth Station is well on the way to fulfilling its ambition to be at the epicentre of the new space economy. Having secured £32 million in funding and contract wins in 2018, Goonhilly is busy expanding its technology resources and service capabilities, and adding specialist transmission capabilities required by space users, to meet industry needs both today and tomorrow. These include establishing an R&D centre at its new Farnborough site, opened in 2018, focusing on innovations in software defined radio, active phased array antennas and user terminals. These will become particularly important to support IP delivery using low-earth orbit (LEO) satellites. Goonhilly is an established global communications services provider, day-to-day providing a comprehensive range of connectivity and operational solutions to the space industry, including GEO, MEO and LEO satellite fleet operators as well as enterprises seeking to grow their businesses on Earth and in near and deep space. Ongoing projects include contracts with SES, Intelsat, Eutelsat and Inmarsat, as well as space agencies, governments, broadcasters and others. The Goonhilly site has world-class satellite capacity spanning 75° West to 65° East. This is complemented by connections with adjacent bundles of subsea cables and fibre. Goonhilly is preparing to open a tier 3/4 multi-million-dollar data centre in 2019, offering exceptional connectivity by linking these cables with satellite communications and fibre. A national infrastructure asset for many decades, the Goonhilly site offers customers a high level of resilience, enhanced by its remote location and a secure energy source including green power from its onsite solar farm and local wind generation. The new high specification datacentre sits at the epicentre of internet connectivity between the US and Europe, and is expected to attract customers which seek a true global presence. The datacentre’s use of renewables, its Enterprise Zone status and its low latency connections are designed to make it a cost-effective choice for hosting, co-location and multi-cloud services for customers in a wide range of market segments. Meanwhile, Goonhilly is creating the world’s first private deep space network in collaboration with the European Space Agency (ESA). The team is also working with researchers to create a combined radio telescope and deep space antenna. University researchers have designed a breakthrough cryogenic receiver and back-end processor that provide the ultra-low-noise performance required for this. Goonhilly has also partnered with Surrey Satellite Technology Ltd (SSTL) and ESA on a pioneering private commercial space exploration project, Lunar Pathfinder. The aim is to take a number of small experimental CubeSats on a piggyback ride to the Moon for communications and navigation. Goonhilly is providing the LMSS (Lunar Mission Support Services) under contract to ESA. As part of its fully-funded business plan Goonhilly is adding ground stations in Australia and the Americas to complete its global deep space network. Using a combination of dish and phased array techniques, Goonhilly will deploy antennas with the flexibility to meet future frequency planning and mission needs. 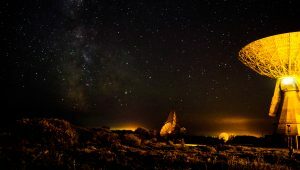 Goonhilly’s new strategic partnership with the Australian Space Agency, struck in February 2019, even before the ASA would celebrate its first birthday, is a key milestone. They will collaborate and create new opportunities in the space economy in Australia, the UK and beyond. A core aim is to progress the Australian space sector and make the benefits of space more accessible for businesses, governments and institutions. In the UK, Goonhilly has a long track record of forging mutually beneficial collaborations with other businesses and universities to develop next-generation space communications and the company plans to take the same proven approach in Australia, and elsewhere. The ASA agreement will provide greater opportunities for technology transfer between the UK and Australia as well as the creation of more skills and new opportunities in the Australian space sector. A key part of this vision is Goonhilly’s role in the proposed SmartSat CRC (co-operative research centre) space research initiative. Led by the University of South Australia, Airbus Defence and Space in partnership with the South Australian Space Industry Centre, the plan for the establishment of the SmartSat CRC was developed in 2018 and was submitted to the Australian government. Other partners include BAE, Harris and Thales, among others. The consortium is now working on next steps and outlining the organisation’s parameters and funding. The SmartSat CRC consortium aims to enhance connectivity, navigation and monitoring capability for the benefit of Australia, helping to maximise its resources by solving major satellite system and advanced communications challenges. The goal is to catapult Australia’s space industry into a leadership position in several areas including intelligent satellite systems, advanced communications, and earth observation driven data analytics. The consortium aims to co-develop intellectual property and specialist industry expertise that will spawn new businesses, create economic value and generate new high-tech jobs. Other economic benefits include applying advanced space technologies and space related data to diverse areas of society and the economy, from agriculture and the environment to healthcare and disaster detection and management. Additionally, Shetland Space Centre (SSC) and Goonhilly Earth Station have partnered to develop rocket launch and tracking business capabilities for the burgeoning new space launch sector. 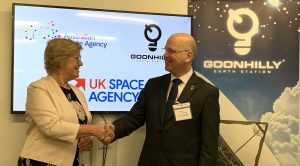 The two companies signed a Memorandum of Understanding in February 2019 committing them to collaborate on a range of projects as the UK’s space sector flourishes. Projects include working together to support both Shetland’s and Cornwall’s aspirations for both vertical and horizontal UK space launches. The firms will jointly promote and deliver launch, monitoring and tracking capabilities from their two sites at the extremities of the UK. The burgeoning low earth orbit (LEO) sector is an area where Goonhilly expects to play a very important, enabling role. Through its expanding relationships with emerging LEO constellation operators, Goonhilly aims to help operators deliver broadband and Wi-Fi to places that are otherwise largely starved of the reliable, 24/7 year-round connectivity needed to advance economies and support communities’ needs. Goonhilly will also provide all the reliable testing and communications tools these LEO providers need as they launch their satellites and roll out their technologies. The company sees its capabilities helping move the space industry forward on multiple fronts. Frequency coordination between mobile 5G and satellite communications is a complex area in which Goonhilly sees itself as a facilitator. The company envisages leveraging its technical expertise and worldwide network of partners to help stakeholders across the ecosystem to navigate the inextricably interlinked labyrinth of technologies and regulations. Goonhilly’s success so far has been built upon collaboration and cooperation with Space Agencies, industry, educational Institutions, telcos, local and central Government. The company’s mission is to adopt this same winning formula across the globe.